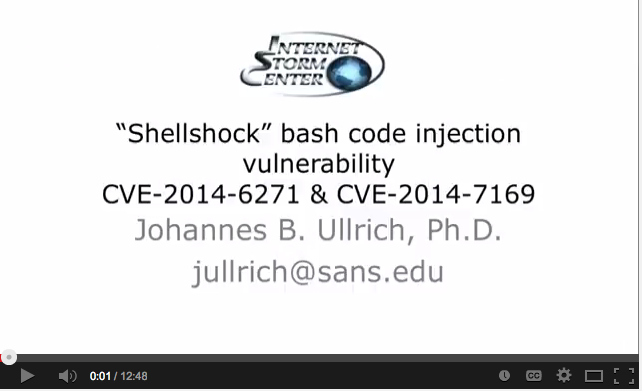 I created a quick Youtube video to summarize the impact of the vulnerability. The tricky part is that there is a huge vulnerable population out there, but the impact is limited as in most cases, the vulnerability is not exposed. In presentation it says "Not an issue for clients. It is a server problem" which is not technically correct. From everything I have seen DHCP client and dhclient is a client problem for this vulnerability. Can you provide the link to the video? added video link. Sorry for missing that earlier. As for the client vs. server: yes, in the DHCP scenario, it is a client problem. But this scenario is less likely to be exploited. it is not just CGI though bash, the vuln hits any CGI that calls system() opne() or popen(). i can confirm that python and perl are vulnerable to this and found as couple of gitweb-server that might be exploited. a sidenote: /bin/sh has to be a symlink to /bin/bash for this to happen, and fortunately debian is safe, while redhat/sles are vulnerable. I'm wondering also about MAMP for Windows, http://www.mamp.info/en/mamp_windows.html. Btw MAMP for MAC OS is Vulnerable.